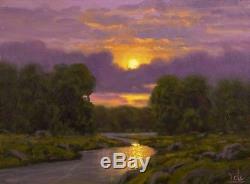 This is an extra-fine original landscape oil painting on professionally prepared wood panel. The painting is signed by the artist Max Cole. This warm, moody, and luminous oil painting was painted using Old Masters techniques to give you a glowing, colorful, and rich visual experience. This one is saturated with a quiet pensive mood. You FEEL this painting before you see it. Although these paintings are recently painted, many antique and vintage collectors appreciate them for their "old world" style. Painting is on professionally prepared wood panel... 100% conceived and painted in the USA by Max Cole. Larger sizes and similar paintings available via commission. Title: "Bright Light in Purple". Size: 9"x12" oil on wood panel. Important message from the artist. LIGHTING : I photograph my paintings using professional true daylight bulbs. CRI measures how close a bulb comes to reproducing true noon-day light (CRI of 100). All paintings change drastically according to the quality and amount of light that strikes them. Proper lighting is vital to enjoying your art. All paintings reflect light rather than emitting light. What this means is you need sufficient light in a high CRI bulb to make them really glow. They become subdued, dull, and dark. Lighting is so important that the very first thing that museums and art galleries do when building new facilities is design the lighting. Everything else is subordinate to the lighting design. Fortunately, it's now easier than ever to properly light your paintings at home. Go to Amazon and type in "art lights". There are many great options to properly light paintings. Some attach to the frame, while others are "accent up lights". All are easy to install and use. You can get hard wired models or plug in models. No matter what you get, try to get bulbs that are at least a CRI of 90 or above. These type of bulbs are called "Full Spectrum" bulbs. A CRI of 98 is ideal and will perfectly match the light I use in my studio. You will see the paintings as I intended them and they will absolutely glow! Once you see one of my painting properly lit, you will be hooked. If you can't obtain ideal lighting, concentrate on achieving a high QUANTITY of light. Some will place their painting above a regular lamp to get acceptable results. High CRI bulbs (aka Full spectrum bulbs) are available on Amazon for your regular table lamps. The most important thing is getting a lot of light on your painting... To get a glimpse of the power of proper light on paintings, take one of my paintings outside and look at it in the sun. You won't believe the difference. FRAMING : My paintings are designed to be displayed framed. Framing your new painting will change it dramatically for the better. Try to pick out a frame that is either a washed gold or black with a gold liner. The designs I use tend to be simple frames with some low key carvings. I have found that these types of frames really enhance the beauty of my work. When properly lit and framed, you wont believe how your new painting will transform into something truly special. I'm always here to assist you to make your new painting sing. Feel free to contact me and I can point you in the right direction. The item "MAX COLE Oil Painting Original signed Landscape Antique Vintage American art 430" is in sale since Monday, June 25, 2018. This item is in the category "Art\Paintings". The seller is "maxcoleart" and is located in Appleton, Washington. This item can be shipped to United States, Canada, United Kingdom, Denmark, Romania, Slovakia, Bulgaria, Czech republic, Finland, Hungary, Latvia, Lithuania, Malta, Estonia, Australia, Greece, Portugal, Cyprus, Slovenia, Japan, China, Sweden, South Korea, Indonesia, Taiwan, South africa, Thailand, Belgium, France, Hong Kong, Ireland, Netherlands, Poland, Spain, Italy, Germany, Austria, Israel, Mexico, New Zealand, Philippines, Singapore, Switzerland, Norway, Saudi arabia, United arab emirates, Qatar, Kuwait, Bahrain, Croatia, Malaysia, Brazil, Chile, Colombia, Costa rica, Panama, Trinidad and tobago, Guatemala, Honduras, Jamaica, Antigua and barbuda, Aruba, Belize, Dominica, Grenada, Saint kitts and nevis, Saint lucia, Montserrat, Turks and caicos islands, Barbados, Bangladesh, Bermuda, Brunei darussalam, Bolivia, Ecuador, Egypt, French guiana, Guernsey, Gibraltar, Guadeloupe, Iceland, Jersey, Jordan, Cambodia, Cayman islands, Liechtenstein, Sri lanka, Luxembourg, Monaco, Macao, Martinique, Maldives, Nicaragua, Oman, Peru, Pakistan, Paraguay, Reunion.